The Camino de Santiago is an ancient pilgrimage of great historical, cultural and spiritual significance which continues to be shared by pilgrims from all walks of life. It is the only long-distance route to have been awarded World Heritage recognition. The Camino is more than a journey across the Spanish landscape. It is a personal journey which unites people from many parts of the globe, all of whom decide to undertake this pilgrimage. Arrival to Astorga and a chance to explore this interesting city with its walled city centre, episcopal church designed by Gaudi and beautiful Cathedral. 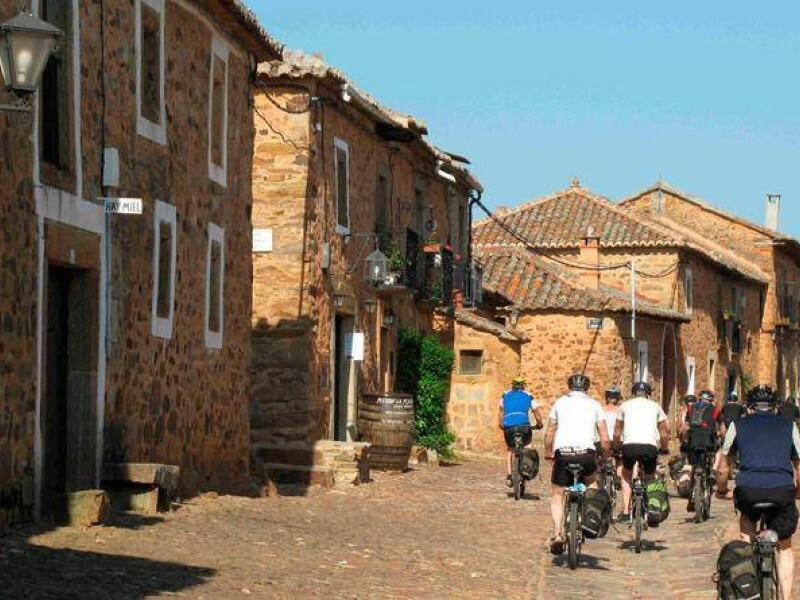 Today you will cycle into the Maragatería area, a wooded mountainous region where beautiful villages with large red stone houses dot the landscape. You will climb to the highest point of the tour. Here you will pass the stone cross at 1.510m, where traditionally each pilgrim leaves a stone they have carried all the way from their homeland. You might want to bring your own small pebble with you! Later you will descend into the rich valley of the Bierzo. On day 3 you will cycle through the flat cultivated landscapes of the Bierzo valley, which produces excellent wines, fruit and vegetables. Around midday you will reach the mountains as you go through the historic town of Villafranca del Bierzo. Depending on which hotel you are at, you will then have to climb the famously steep O´Cebreiro mountain pass which separates the regions of Castilla and Galicia or you will stay at the foothills and do the climb the next morning, whichever, the views at the top are well worth the effort! Today sees you in a new region, with a very different climate, vegetation and people. Galicia is green Spain, wooded and mountainous. Today you will descend into the small town of Samos where you will find an ancient monastery from the middle Ages which still remains inhabited by monks. Don't miss the opportunity to visit it! Then your route meanders alongside streams and rivers flowing from the mountains to the town of Sarria. Today you can enjoy one of the most beautiful sections of the Camino in Galicia.Travelling on narrow secondary roads through woodland and green pastures, you will discover a true haven of peace and tranquility as you go past tiny villages where people live off the land, as they have done for generations. Today you'll be tempted to stop and savour every village you encounter, each one a hidden gem with stone-built houses, narrow streets and seemingly caught in a time warp! You can breathe the history along the way and can only imagine how many thousands of people over the centuries have shaped this legendary route. Time to relish the last remaining kilometres of your adventure. Today the Camino leads you into the very heart of the unique city of pilgrims, Santiago de Compostela, into the Plaza de Obradoiro overlooking the Cathedral built in honour of Saint James. A city shrouded in centuries of legends, you will arrive elated to the echos of the pilgrims who have gone before you. This is a truly spiritual and uplifting experience! With a buzz of satisfaction and a smile on your face you will arrive with enough time to get your “Compostelana” or Pilgrim’s Passport. This singular city offers many important landmarks for you to enjoy, every corner imbued with history and atmosphere. You won't want to say goodbye! Departure or why not linger in Santiago a few days to rest and enjoy. How about a touch of Luxury in the 5***** Parador? You will need to be in good health and reasonably fit. These trips may contain elements that are quite active, but not too hard. We recommend flying to Madrid or Santiago airport to reach the starting point of this cycling holiday. MADRID TO ASTORGA. The bus company ALSA runs a daily service from Madrid to Astorga (most buses leave from Madrid south station “estacion sur” but some buses also leave from the airport, terminal 4). There are typically 5 buses each day and they take between 4 and 5 hours and cost is around 25€ per person. LEON TO ASTORGA. Several trains (RENFE) each afternoon taking 30mins and costing 10€ per person. The bus company ALSA runs many buses to Astorga, taking 50mins and costing around 4€ per person. SANTIAGO DE COMPOSTELA TO ASTORGA. RENFE run one early morning train (9:25) taking just over 5 hours and costing around 32€ per person. The bus company ALSA runs one early morning bus (8am) taking 6 hours and costing around 27€ per person. How do I get back? From Santiago airport back home directly or via another airport. to find the best flight prices by date or Voyages SNCF for European rail travel. There is customer car parking available at most hotels for a supplement. Please contact us for more details. The Camino de Santiago cycling holiday includes the daily transfer of luggage to the next hotel and local support if required. - 7 nights accommodation (bed and breakfast) in twin or single rooms with own bathroom. Our hotels are conveniently positioned very near or on the Camino and are always the best quality on offer along the way. They are typically of 3 star grading.